BitClone9 is a safe and straightforward application for creating backups of partitions and restoring them when required. The interface of BitClone9 is clean and easy-to-use, with functions separated into different tabs. Different options are available like "Save Disk/Partition to Image", "Save Image to Disk/Partition", "Save CD/DVD/BD to ISO Image" along with a DVD/BD burning tool. Images are saved in an "Image9" format. There are several useful features in this program and it uses ISO image formats which may be burned to an optical disk. Retrieving and restoring previous backups is also supported. 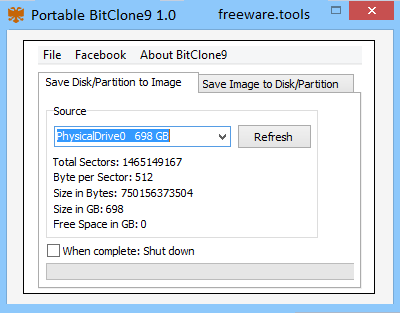 Overall, BitClone9 provides an easy way to backup partitions and save them. Portable BitClone9 is an efficient software solution whose main aim consists of offering you a reliable method of backing up your most important files and folders, so you never run the risk of completely losing your data should you experience a system crash. Since the program does not require installation in order to function, you can simply decompress the downloaded archive and run the executable to get started. Consequently, you can store and carry Portable BitClone9 on a removable memory device, using it whenever you need, without leaving traces on the host computer. The main window of the application is organized in four main tabs, each one with a distinct function in the backup operation. On the lower edge of the window, it displays a progress bar to inform you of the undergoing backup process, also allowing you to shutdown your PC when complete. Depending on your current needs, you can access ‘Save Disk / Partition to Image’, ‘Save Image to Disk / Partition’, ‘Save CD / DVD / BD to ISO Image’ or ‘Burn ISO Image to CD / DVD / BD’ sections. Portable BitClone9 is capable of duplicating a whole computer partition and saving it to IMAGE9 format, so you can restore it with a few button presses, if you were to run into a problem that causes you to lose all your information. At the same time, the utility can copy the contents of various types of discs (CD, DVD, BD) to an ISO file, which you can quickly burn onto a new disc, when needed. This can come in handy should you need to build a bootable media. All in all, Portable BitClone9 proves to be a reliable and accessible application the offers you the means of effortlessly duplicating selected PC partitions, helping you restore them with minimal effort, in case you ever need to.